According to the name of this low, but interesting pass, 4 roads meet here. Actually it's at least 5. Three of them meet in practically the same point. The third one is about 20 meters south west of the other two before mentioned routes, but it forks again within about 20 meters. Instead of crossing the pass, most cyclists just keep on climbing towards the Col d'Eze or one of the many passes above it. Here are just a few notes on the approaches to Col de Quatre Chemins. 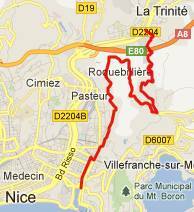 From South: This is the road with the most traffic and also the most direct approach, directly from Nice: the bd de Observatoire. It is the easiest to find from the bottom, just follow signs for Menton and Monaco over the Grand Corniche. The lower climb is lined by vacation condominiums and the occasional villa, also a 2 star hotel. Slowly the viewshed changes away from the Nice rail yard to an expressway viaduct in la Trinite. The road levels out a bit and passes several entrances to the Vinagrier Park, a place of peaceful repose, not far from the forest of concrete walls and statues surrounding Nice. By the time you reach the pass you are practically surrounded by forest, bursting with bird calls. From West: The next road clockwise to the right is a descend lined by brick walls of densely built residences, hidden in a jungle of garden vegetation. It is signed as going to "La Trinite" The route emerges at a roundabout across from socialized housing high rise buildings. The last part descends impossibly steep under the expressway bridge and then turns at a right angle towards the main road in La Trinite. There is a directional pass sign in this sea of garbage, across from the low income housing. Where the pass turnoff meets the main road there is no sign, but once you have seen the roundabout you will always remember the spot. A picture of it is included as the lower right picture in the group of four. This approach combined with the southern approach makes for a quick escape from Nice stop and go traffic. Going back to the top, the previous road forks within the first 20 meters below the Col de Quatre Chemins. It looks like going right here also leads down to la Trinite. The road stays at altitude longer, taking in another neighborhood under the expressway bridge. However having taken this turn, invariably leads to many different dead ends, still far above Trinite (at least while staying on pavement). It seems the people living here would rather associate with the "on the hill crowd". The story is different if going off pavement is an option You can now take a right on this road through garden housing and complete a ride on an unpaved balcony path up to Col d'Eze. Actually this is the most peaceful way to get to Col d'Eze. All of these Col de Quatre Chemins side roads have their own peculiar, interesting neigborhood, scenic twist. From North1: Proceeding further clockwise from the Col de Quatre Chemins, the next road keeps on climbing to the Col d'Eze and further to the col de Guerre, before descending to Menton. Clockwise from top left: below highway bridge at bottom of western approach; upper western approach; socialized housing towers from middle of southern approach; la Trinite where western approach begins. From North: the sign says it goes to Villefranche and Beaulieu on the coast, haven't ridden this. From South. The last approach on the Chemin de Vinaigrier leads just a few feet higher and could be considered a separate summit. A bus stop is located on this route at the intersection. The route descends through a sea of concrete housing walls to the Corniche Moyenne. The route is quite a bit steeper than the bd de la Observotoire and also more densely occupied. - No luxuriant jungle like vegeation and bird call accompaniment on this route. At the intersection with the Corniche Moyenne there is a "Restaurant du Col", what - yet another Col ? Don't know if this one has a name or not. Dayrides with this point as intermediate summit are on pages Col de Torini, Col de Madone.